Canada acceding to this confederation, and joining in the measures of the United States, shall be admitted into, and be entitled to all the advantages of this Union: but no other colony shall be admitted into the same, unless such admission be agreed to by nine States. That’s Article 11 of the Articles of Confederation, the precursor to the Constitution. Apparently Canada was offered an opportunity to join the United States. And apparently Canada declined. If I had learned that in school years ago, clearly I hadn’t remember it, because it came as a surprise when I read it in a copy of the Articles displayed in the West Wing of Independence Hall in Philadelphia. Yes, confirmed the National Park Service ranger on duty, Canada had been asked and Canada said no. 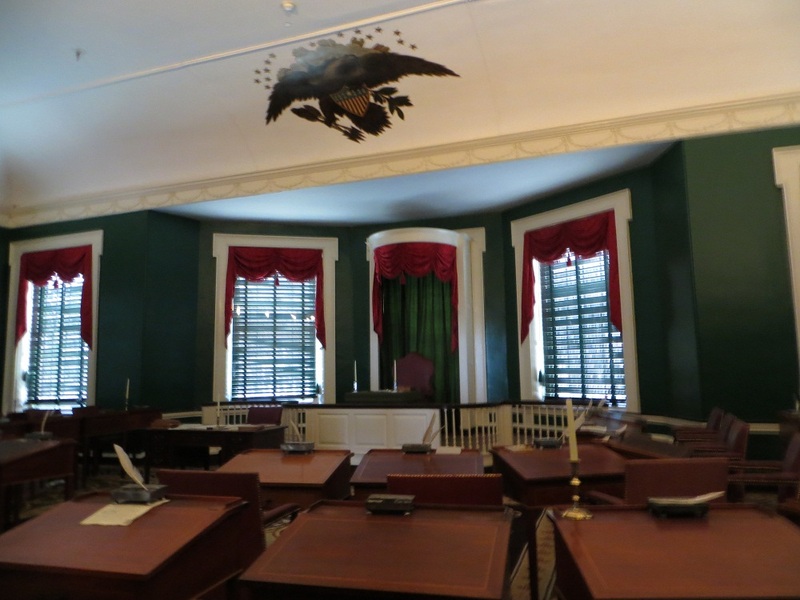 Independence Hall was commissioned in 1732 as the Pennsylvania State House. The Second Continental Congress started meeting there in 1775 and continued until December 1776, when the British chased them out. After that, Congress was back and forth between Philadelphia and Baltimore, Lancaster, York, Princeton, Trenton, Annapolis, and New York. Their final stint in Philadelphia ended in 1800, when the capital of the US moved permanently to Washington DC. 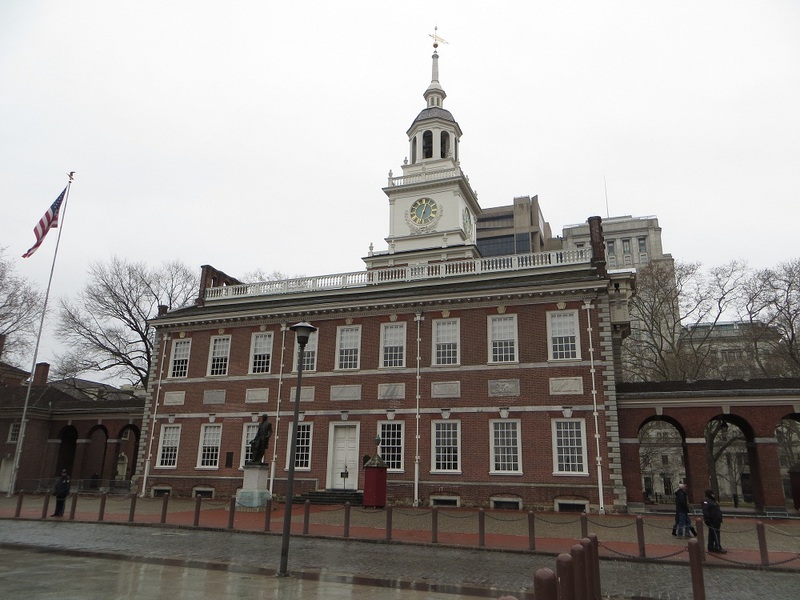 Independence Hall is part of an 18th century government complex that also includes Congress Hall and Old City Hall. The complex is now run by the NPS. It requires a timed ticket to get in. There are a few same-day tickets available at the Independence Hall Visitor Center while they last, but I didn’t want to take the chance so I reserved mine online weeks in advance. We picked up our tickets at the Visitor Center and were told to get to Independence Hall 30 minutes before our tour – the only way that you can see the main part of Independence Hall — to give us time to get through security. The Visitor Center is huge, with films, exhibits, food, shops, and an underground parking garage. In mid-March, security didn’t take 30 minutes but I can imagine that it’s a zoo in the summer. Once into the secured area, we had time before the tour to see the West Wing exhibit, which was a small display of reproductions (we have many of the originals, but we can only display them a few weeks at a time, said the ranger, for preservation’s sake) of documents crafted in Philadelphia. At 1:00, we joined about 50 other people for a ranger-guided tour of Independence Hall. The ranger gave us a brief introduction to the Continental Congress before taking us into the main part of the building. The first two stops were the Supreme Court Room (where the U.S. Supreme Court met for one session in 1791) and the Assembly Room (where the Declaration of Independence and the Constitution were debated and signed). The crowd was large and I couldn’t see or hear the guide. 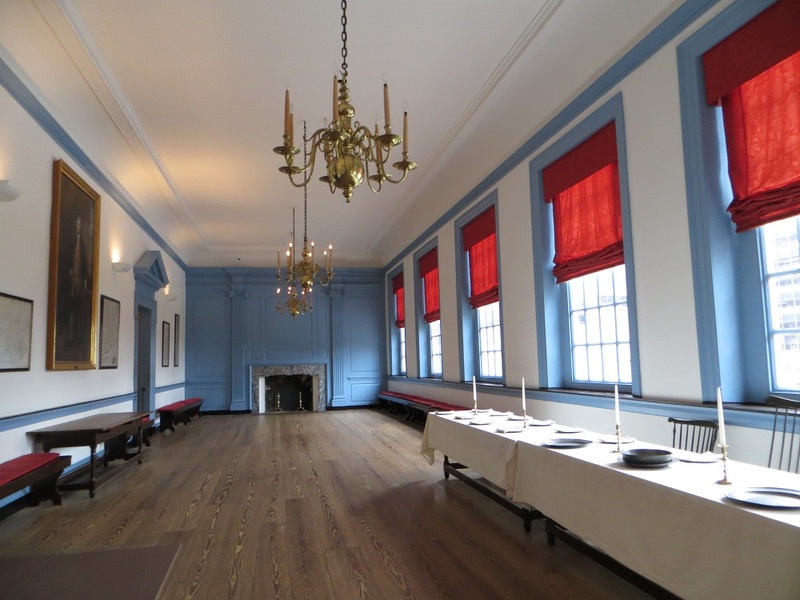 So instead, I wandered the hall and got some crowd-free photos of the adjoining rooms. Then we went up the stairs to see the Long Gallery and some meeting rooms. No lectures there, just Q and As. Patricia asked why Ben Franklin was called “doctor.” The guide said that it was because he got an honorary doctorate from St. Andrews in Scotland, for his work on electricity. 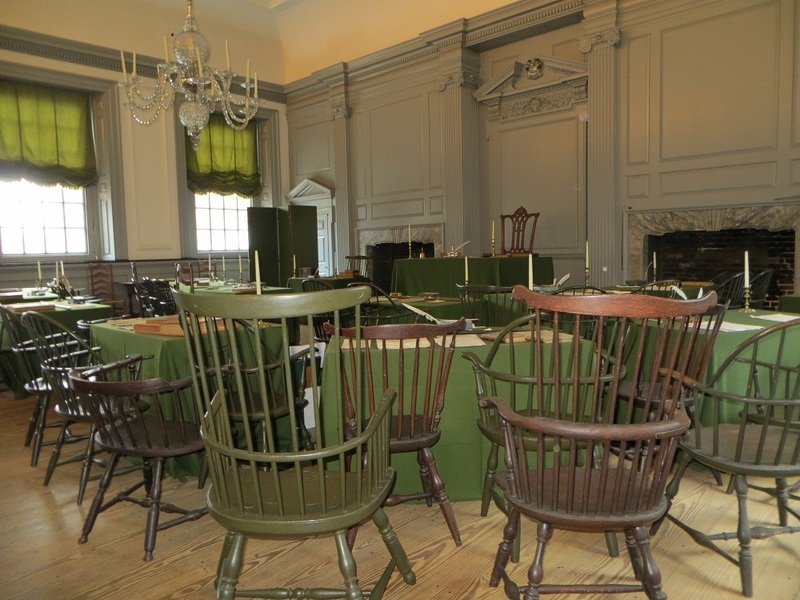 Most of the furniture in Independence Hall are reproductions and period pieces not original to the Hall. The originals were burnt for firewood during the British occupation of Philadelphia. There are a few non-furniture pieces – an inkwell here, a map there – that were present during the early years. The tour took about 30 minutes. After Independence Hall, Patricia and I went to see Congress Hall, still within the security barriers of the complex. The U.S. Congress met there when Philadelphia was the capitol of the United States, from 1790 to 1800. George Washington’s second and John Adams’ only inaugurations were held there. There was a sign in front of the door, saying that tours – the only way that we could see the building – were every half hour. We got there just as a tour was starting and saw the House chamber on the first floor, the Senate chamber on the second floor, and some committee rooms. Much of the furniture there was original. We didn’t see Old City Hall, which was on the east side of Independence Hall. It’s where the first Supreme Court met. 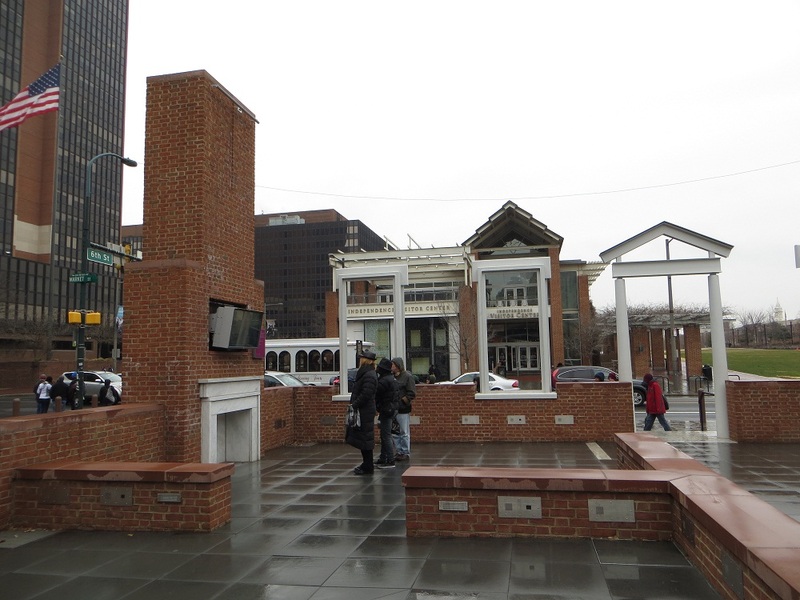 Also within a block or two of Independence Mall and under the purview of the NPS: the Todd House, the Declaration House and the Liberty Bell Center. The Todd House is where Dolly Madison lived with her first husband. I wanted to see it but didn’t, because Todd House requires a ticket (available only on the day from the Visitor Center) and they’d run out by the time I got there. The Declaration House is a reconstruction of the house where Thomas Jefferson wrote the Declaration of Independence. Surprised that I wasn’t interested in seeing it? The Liberty Bell Center houses the – surprise! – Liberty Bell. No reservation or ticket necessary, but there was a crowd and a long line. I don’t do crowds and I don’t do lines. 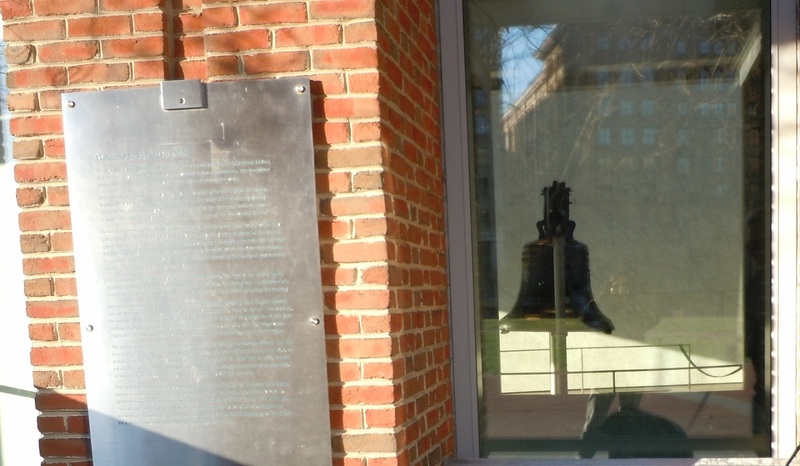 And since it turned out that the bell really didn’t ring in 1776 but was — like Betsy Ross — the subject of a made-up story (the NPS interprets it as a great symbol of independence, without claiming for it a role in any event), I’m sort of eh about it. The building has huge windows, so I could see the bell from outside anyway, which was enough for me. The house where George and Martha Washington lived during his presidency was located next to where the Visitor Center now stands. It’s gone, but the NPS has framed it and put up exhibits on life for the Washingtons and their slaves in Philadelphia. 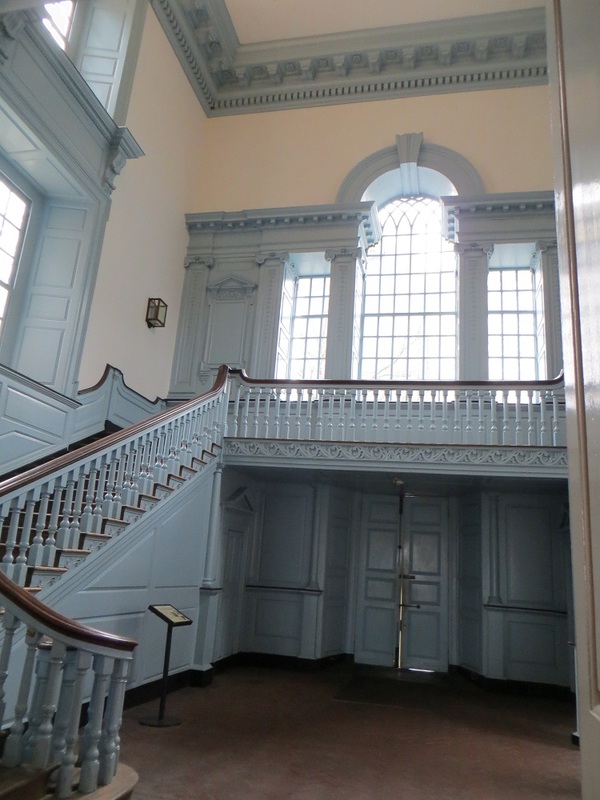 Gallery | This entry was posted in Pennsylvania and tagged Independence Hall, Philadelphia history. Bookmark the permalink. I wonder how different history would have been had Canada joined the US? That’s an interesting thought. We’d definitely have been missing their support in international conflicts, which may have influenced the outcome. The one major historic event that I can think of off hand: the US wouldn’t have tried to take Canada over during the War of 1812. I didn’t know that about Canada either, despite growing up only about 20 miles from the border. I agree about the crowds, but I think it is the necessary evil in order to see some of our historic gems. And I suppose it means that there is an interest in some sites. I can’t tell you how many historic sites I’ve been too where I have been all alone though. Thanks for sharing! I agree — crowds are the price we pay to see them. And I’m happy that there’s enough interest in history and these sites that there are crowds. I just selfishly want them all to myself. The building is gorgeous. I’ve been thinking about it, and I think that political or policy-centric history is too close to my day job for me to want to hear much of it when I’m away from the office. I thought that was a lovely building and although you might have found it boring it didn’t come across in your post. I’m glad it didn’t sound boring. Its a struggle, to be interesting when I didn’t think that the experience was (although sometimes, the experience is interesting, even though the tour or topic wasn’t).